Ishwari Tamang (left) with her children and two nephews at Raffles Place, with familiar landmarks such as The Chartered Bank in the background. Date: Feb 1967. Photo Collection: Mangalsing Tamang / SGPM. Devraj Tamang in a baby stroller beside an old radio. Date: 1964. Photo Collection: Mangalsing Tamang / SGPM. Ishwari Tamang (left) with two other Singapore Gurkha wives, all dressed up for an event at home. Photo Collection: Mangalsing Tamang / SGPM. Oct 1970. Ishwari Tamang in front of Oriental building at Raffles Place. Date: February 1967. Photo Collection: Mangalsing Tamang / SGPM. Ishwari Tamang and two other Singapore Gurkha wives at an outing along MacRitchie Reservoir. Date: July 1968. Photo Collection: Mangalsing Tamang / SGPM. 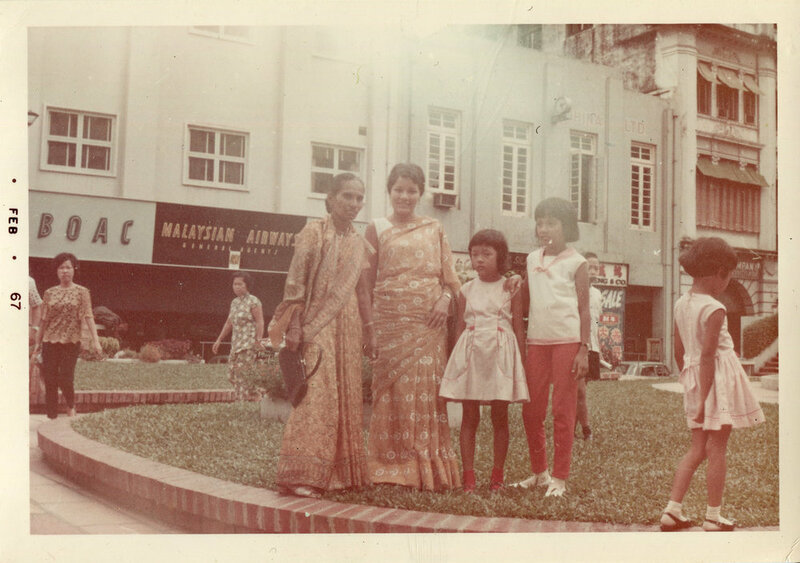 Ishwari Tamang and her family pose for a photograph in front of buildings with the title British Overseas Airways Corporation (BOAC) at Raffles Place. Date: February 1967. Photo Collection: Mangalsing Tamang / SGPM. Ishwari Tamang standing in front of United Overseas Bank Ltd building at Raffles Place. Date: February 1967. Photo Collection: Mangalsing Tamang / SGPM. An annual dinner and dance ball at Hotel Malaysia, Golden Lotus Room in Singapore. Mangalsing Tamang and his wife, Ishwari Tamang, sit in the middle of the table. Date: 3 September 1970. Photo Collection: Mangalsing Tamang / SGPM. Mangalsing Tamang dancing with his wife, Ishwari Tamang, for an event – most likely at the Police Academy on Thomson Road. Date: June 1967. Photo Collection: Mangalsing Tamang / SGPM. Ishwari Tamang in her kitchen at Block 'P' inside Mount Vernon Camp. Date: October 1970. Photo Collection: Mangalsing Tamang / SGPM. Dhanpati Gurung's daughter Sita Devi (left) with youngest son Yam (middle) at an unknown location. Date: Late 1970s. Photo Collection: Dhanpati Gurung / SGPM. Gurkha wives and children inside Mount Vernon Camp. Date: Unknown. Photo Collection: Dhanpati Gurung / SGPM.